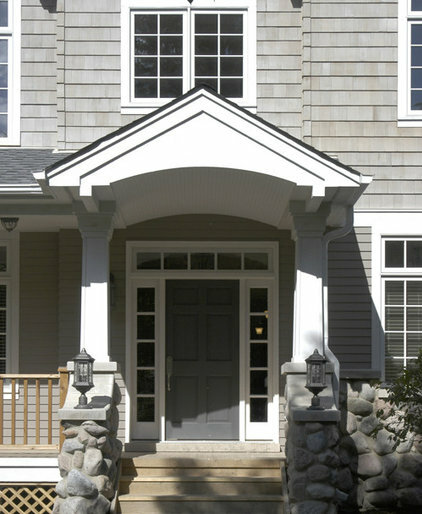 Front Door | Garage Door | Shower Door: What Does Your Front Door Say? 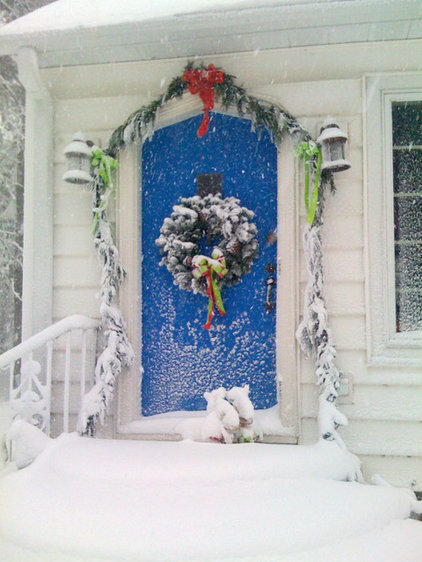 When I first came across this wonderful, snow covered, blue door, I was completely mesmerized. Isn’t it beautiful?! 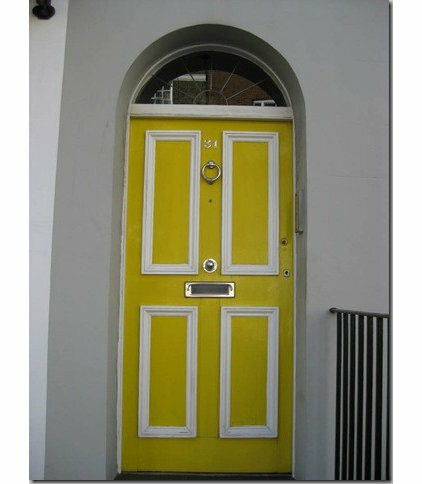 This photo started me thinking...if you have a front door that requires painting, how do you go about choosing the color to paint it? Did you know many cultures associate rather complex meanings to the colors we choose for our home, especially the color we choose to paint our front door? The front door is thought to be the “mouth” of the home, the entry point where energy, abundance and opportunities may find us. Wow...that’s a pretty big responsibility to hang on a front door! I thought it would be fun to explore some of the symbolism and beliefs associated with the colors we sometimes choose for our front doors. Throughout history, blue has often represented sky, water and abundance. Blue is also considered a great Feng Shui color. If you want your home’s curb appeal to suggest a feeling of abundance and prosperity, consider painting your front door a beautiful blue. 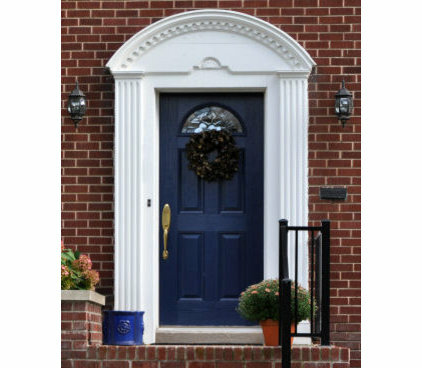 Dark blue doors are believed to create calm and peace for your home...in turn, bringing those feelings to your guest and family who enter through and into your home. Additionally, blue is thought to bring lots of positive energy into a space. Yellow is a color that evokes mental clarity, perception, understanding, wisdom, confidence, curiosity, humor and merriment. Wow, I'd like some of that coming into my home...wouldn't you? How about a green door? Green is always a great choice for the front door since it's a color that is said to represent balance, peace, compassion, growth, renewal, and harmony. 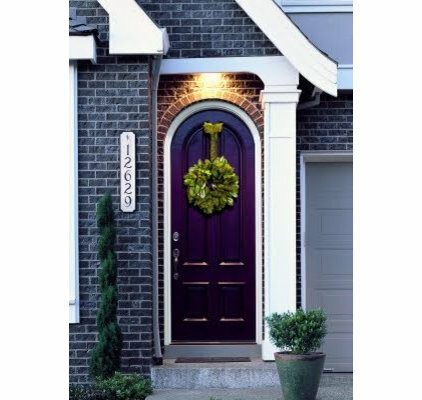 Surprisingly, purple is a pretty popular color for front doors. It's symbolizes energy and is thought to invite many opportunities into your home. Some folks even believe you can improve your opportunities...or whatever aspect of your life that relates to the doors direction, or the direction it faces, simply by painting your front door purple. Whether you're hoping for a better career or better health, some say purple will help. 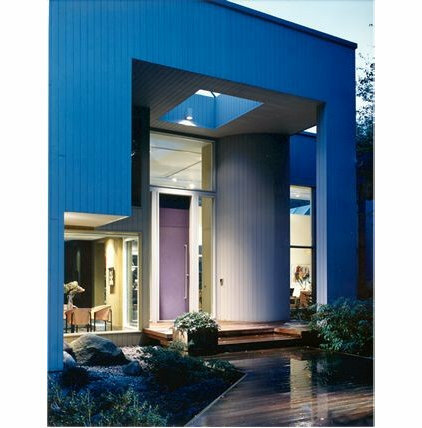 There is only one exception with purple, and that is the northwest-facing front door. Better to paint this door gold, white, silver, or gray. 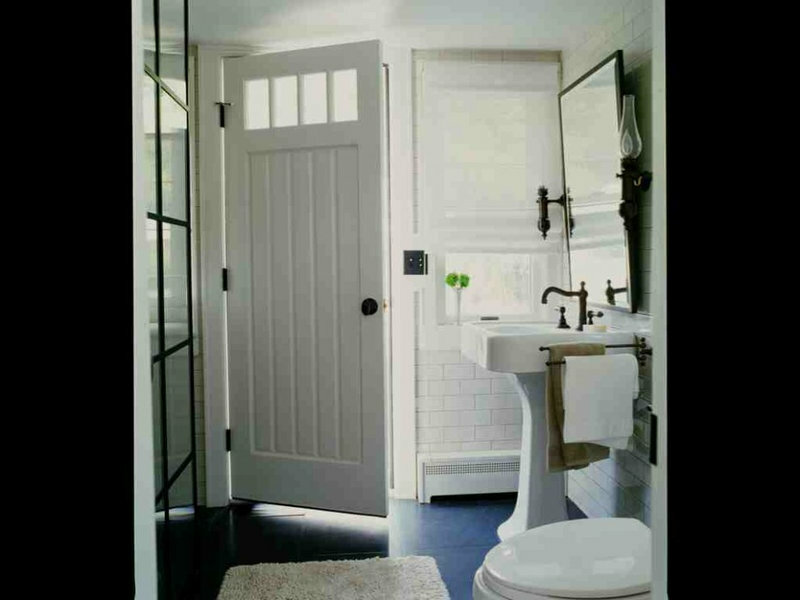 White is a classic color for doors, especially on a cottage style home. Throughout history, white has come to represent purity, serenity, and virtue. 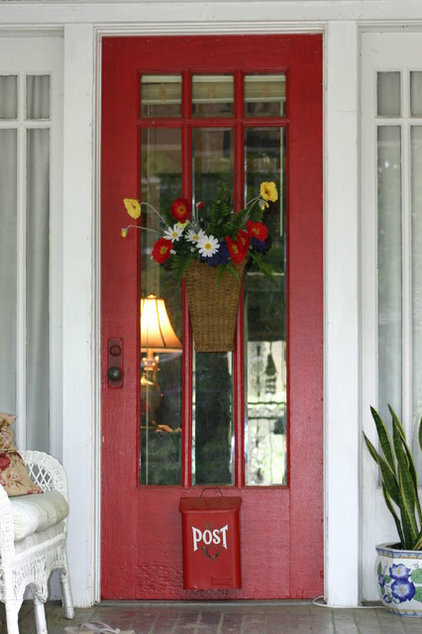 In Feng Shui, a red front door means “welcome.” Interestingly, in early American tradition, it meant the very same thing. In fact, if a home had a red front door, tired travelers who might be traveling by horse and buggy would know the home was a place where they would be welcomed to stop and spend the night or rest.